Click on the image to take a peek at this book on Amazon! A quick summary: No matter how hard Trisha tries, there just seems to be no way to impress Miss Keller, her writing teacher. Miss Keller critiques each one of her student’s writing, leaving Trisha and her classmates feeling discouraged. Trisha’s neighbor, known as Pop, recalls how his sons once had Miss Keller as a teacher, and offers words of encouragement. Still, Trisha can’t seem to make Miss Keller happy. One day, Trisha is positive that she finally nailed her writing assignment, but Miss Keller tells Trisha that she lacks emotional connection in her writing. Devastated, Trisha visits Pop, who tells Trisha about how his son became a journalist and won a Pulitzer Prize for reporting, and he credited Miss Keller for helping his son become a gifted writer. Shortly thereafter, Pop dies unexpectedly, and Trisha is heartbroken. She pours her heart into writing a piece about Pop as her term essay. Finally, Miss Keller is moved by Trisha’s writing, and tells Trisha that she wrote a stunning tribute to Pop… the crowning example of a personal narrative. Prior to class, I will have the title printed across the top of the anchor chart, the lines drawn, and the visual cues ready to go. I'll begin the lesson by saying something like, "We've already learned several elements of a strong personal narrative. Turn to a partner and see how many the two of you can name." After giving students two minutes to discuss the topic, I'll randomly choose some students to share their answers. Having trouble reading the words? Just download the free printable and check out page 3! The same words are printed there. I anticipate referring to this anchor chart often as we progress through our personal narrative unit. I also created the following checklist for students to use as a writing or revising tool. 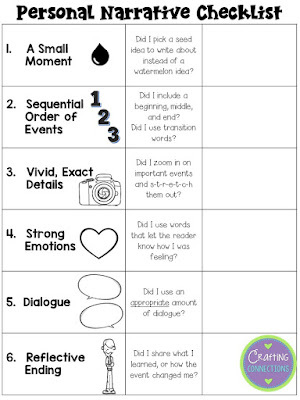 They can use this checklist to analyze their own writing to make sure they included all of the necessary personal narrative elements. 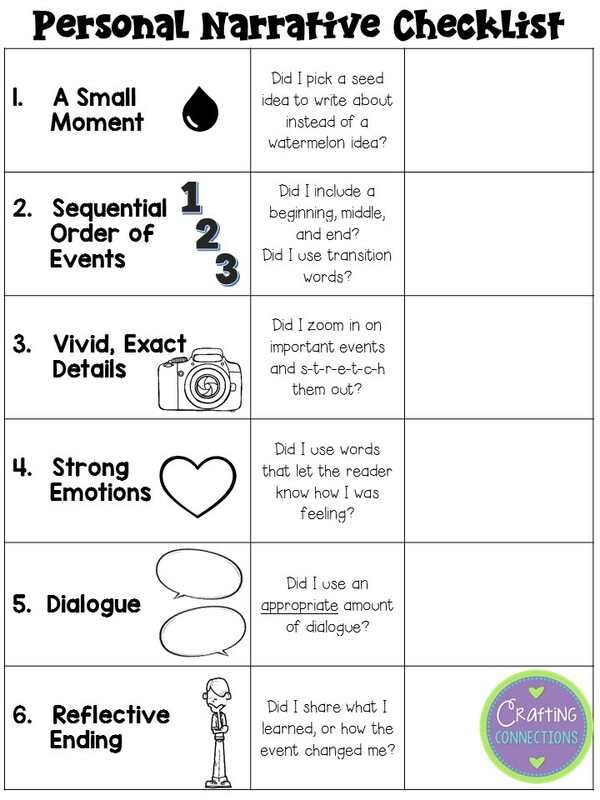 I'm also excited to use this as a tool during writing conferences to facilitate conversation with my young authors! If you would like to replicate this lesson for your own classroom, feel free to download the printables here! I've included both checklists, an answer key, and the visual cue images in case you want to replicate the anchor chart. CLICK ON THE IMAGE BELOW FOR THE FREE PRINTABLES! 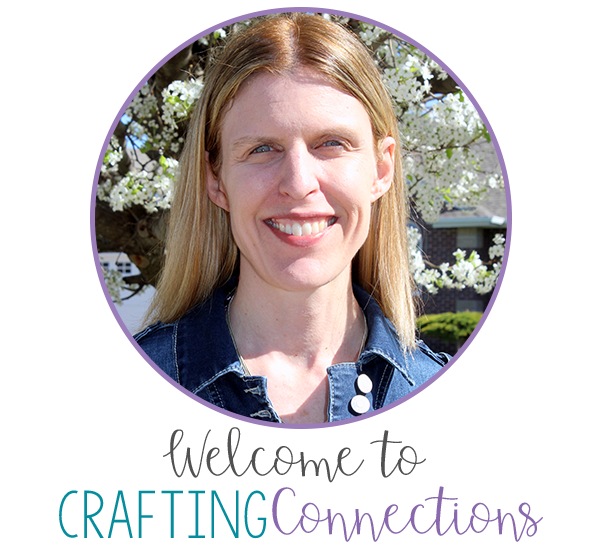 If you happen to be looking for additional resources to use when teaching writing, feel free to check out my TpT store! 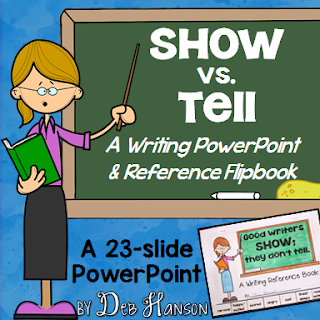 One of my favorite writing lessons involves using the PowerPoint shown below! Great freebie writing tool! Can't wait to share your post with my teachers! What a wonderful lesson! I love the anchor chart, and you know how much I love Patricia Polacco! Glad to add this to my PP collection and so glad you joined in. Have an awesome weekend! What a fabulous writing tool! Thank you! Love the lesson! I'll have to add this book to my list of read aloud books. Thanks so much! This is an awesome lesson! I love being able to tie my Reader's and Writer's Workshop lessons together!! I am a very new teacher and my content area is NOT ELA to say the least but I like it. I have a question when should I read the book, after 1,2, and 3 has been taught or while they are being taught? Hello! I would read this book after #1 and #2 (on the anchor chart) has been taught. I think this would be a great lesson to do while you are teaching students about #3 (vivid, exact details). This is a wonderful lesson! I am excited to try this with my third grade students! We are in the middle of our narrative writing unit right now! Thank you for sharing this!